Today, after lunch, we decided to take a trip to see the Cariari Mall, just minutes from our house. We were looking for something to do on a rainy day and the kids also had $20 from Grandma Candelaria to spend. So we gave the mall a try. But G wasn’t sad for long because we found the toy store and the boys were the first to spend their money. 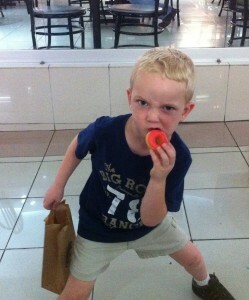 E spent all his money on a “rare” ninjago. G found a Holley Swiftwell with wings that he has been begging to buy for weeks. The store had a buy one get one free, so G got a Finn McMissile and a Holley for only $10. He was super happy and excited he still had $10 to spend. As we took the escalator down to the next floor, I saw the cutest mini donuts at Dona Dona. I showed K and knew she would freak out! Our family LOVES, LOVES, LOVES donuts. I blame myself really. I ate too many of them during ALL my pregnancies. I think I created their donut fascination. Both K and G got some donuts. E wished he could but his money was spent. L couldn’t because she refused to finish her lunch and was prevented from spending her money as a consequence. 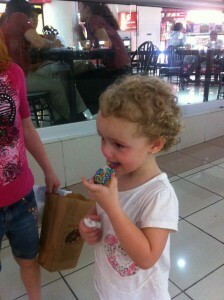 Of course the little lady at the shop couldn’t help herself and gave L a blue sprinkle donut to make her stop crying. I was perplexed what to do. Do I offend this woman and tell her no so I can stick to the consequence L made for herself? 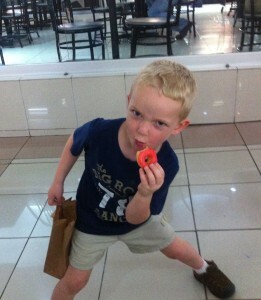 Or do I accept the donut and hope the lesson was still learned? 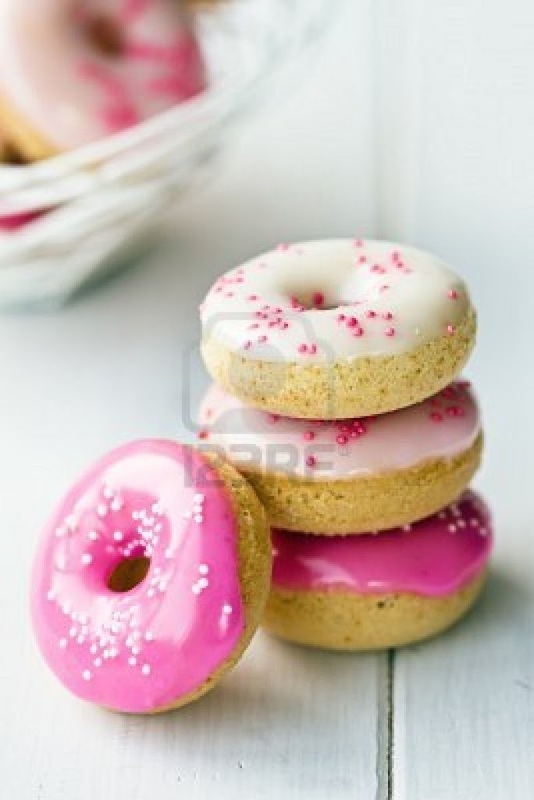 Of course I accepted the donut, I didn’t speak any Spanish to explain the situation, but I insisted L thank her for the donut. Of course L refused! It was a huge mess! I finally insisted she say thank you or I would give the donut to E and he would say thank you. So, she gave in, with my help, and said a lousy thank you to the nice, but bothered we were still there, lady. It is sad really how we must constantly train our children, especially in public. I insisted that the kids stop a moment so I could take a picture of these adorable donuts. I couldn’t take the pictures fast enough. 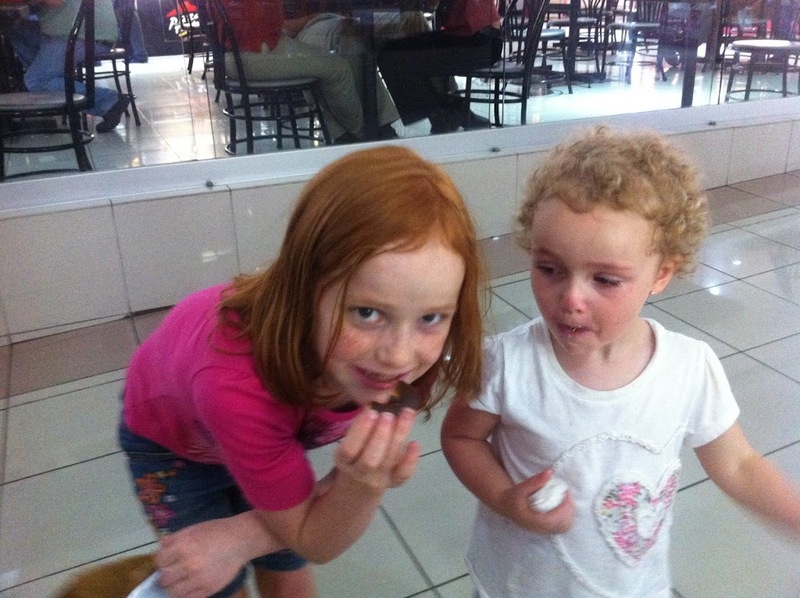 L shoved her’s in her mouth and K just about had her’s gone before I got the picture. G agreed to the picture but decided to be silly about it. Here is a better picture of what they looked like. 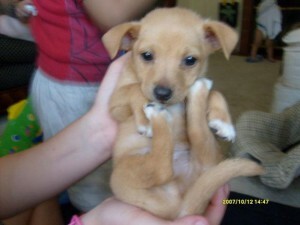 Cute huh! 5 for $1.60. A bit pricey but like I said, my kids LOVE donuts. What about E? His cute brother G said he would share one with him. Unfortunately he was having so much fun eating his 1st donut, he forgot to share with E. I finally reminded G and he gave one to E. Poor E. At least he got one, right? What does a parent do? Give in to the sulking? Or just go on like there isn’t a problem? 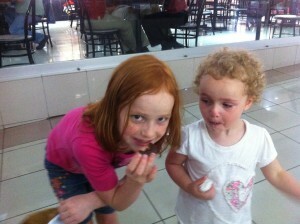 After a few minutes at the McDonald’s play place, we came home and E and L were able to get a real treat. K and G were upset about it because they wanted another one. What does a mom do? Well, this mom said, “NO!” and sent them off to play. But I had a sweet treat up my sleeve. I was preparing this for dessert tonight. . . Does anyone know what this is? Give you a guess. You get them at Disneyland by the Tiki Tiki room. Any quesses? Yes! It is a Dole Pineapple Whip. I LOVED these as a child (remember Mom and Dad). Well, our cute landlady gave us a pineapple. I wanted a fun dessert to make. 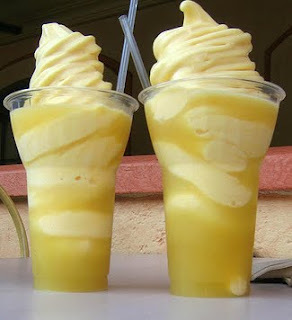 I looked at my pinterest board and saw this recipe: http://prudencepennywise.blogspot.com/2011/03/dole-pineapple-whips-from-magic-kingdom.html. I was so excited to try it. Could I make something like this in Costa Rica? You bet I did! The family LOVED them and so will you. Instead of 2 (20 oz.) jars of pineapple, I just used an entire pineapple. It worked perfectly. Give them a try, you’ll love them! Now, I do have one more sweet treat to share with you, since this is Sweet Treats Day! Our Sunday dinner guests brought over this yummy dessert from Spoon, a Costa Rica restaurant. It is called Flan de Tres Leches and it is AMAZING! 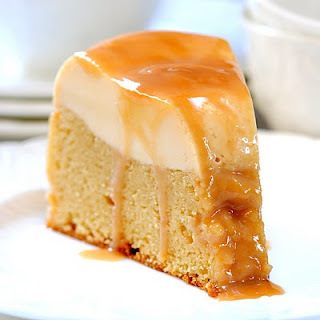 It has three incredible layers of cake, flan, caramel topping and then it is drizzled with sweetened condensed milk that the cake layer soaks up. Out of the kids, E really enjoyed it. But I enjoyed it the most and got to finish off the last piece tonight. Yum! Well, after a day of thunder clouds, heavy rain and bright, white lightning, today turned out to be not so bad. I do miss you all. I didn’t realize how much until the kids mentioned flying in a plane. I said, “Yep, only one week from this Thursday.” E looked at me disappointed. I had a funny feeling and looked at the calendar on my phone. Then I saw I WAS WRONG. We had two weeks from this Thursday. I corrected myself and the kids were excited but I was a bit melancholy. How do you ladies do this? My sister-in-law lived in Wyoming for years, my friend Kori just moved to Texas and loves it there, my parents have a house in Cabo and go for weeks at a time, and Paul’s parents raised their 8 kids in South America for 6 years. Maybe that is the problem, those were all permanent decisions and mineis just a “visit”, or is it? What if we move here one day? Could I really do this as a real part of my life, not just a trip? That is a conversation for another day. Wendi, you can do anything if you just take one day at a time. We love you and miss you. Previous Post New foods the Kids love!